Shocker: Global warming may simply be an artifact of clean air laws | Watts Up With That? A new paper (O’Dowd et al.) from the National University of Ireland presented this summer at the 19th International Conference on Nucleation and Atmospheric Aerosols suggests that clean air laws put in place in the 1970’s and 80’s have resulted in an increase in sunlight impacting the surface of the Earth, and thus have increased surface temperatures as a result. In one fell swoop, this can explain why surface temperature dipped in the 1970’s, prompting fears of an ice age, followed by concerns of global warming as the air got cleaner after pollution laws and controls were put in place. WUWT covered a similar effort (Wild 2009) here and paper here (PDF 1.4 mb) which showed the issue but fell short of showing a provable causation for temperature. Now with this new effort by O’Dowd et al., it seems quite likely that cleaner air is in fact allowing in more solar radiation to the surface, and thus increasing surface temperatures by that increase of insolation. Wild 2012, was a follow up, and figure 1 above is from that paper. Now with O’Dowd et al. and their findings, this “global brightening” as a climate driver is looking much more plausible. This study has demonstrated for the first time, using in-situ PM measurements, that reducing aerosol pollution is driving the Insolation Brightening phenomenon and that the trends in aerosol pollution, particularly for sulphate aerosol, is directly linked to anthropogenic emissions. Ultimately, the analysis demonstrates that clean air policies in developed regions such as Europe are driving brightening of the atmosphere and increasing the amount of global radiation reaching the Earth’s surface. The actual impact of cleaner air and insolation brightening on temperature remains to be elucidated. 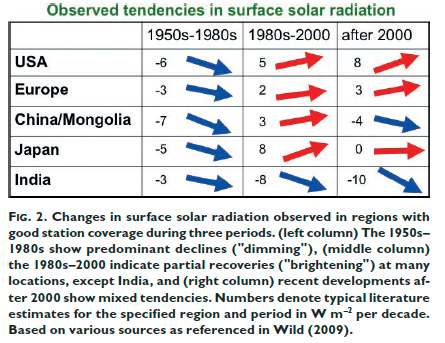 Surface incident solar radiation has been widely observed since the late 1950s. Such observations have suggested a widespread decrease between the 1950s and 1980s (“global dimming”) and a reverse brightening afterward. Cleaner air: Brightening the pollution perspective? Clean-air policies in developing countries have resulted in reduced levels of anthropogenic atmospheric aerosol pollution. Reductions in aerosol pollution is thought to result in a reduction in haze and cloud layers, leading to an increase in the amount of solar radiation reaching the surface, and ultimately, an increase in surface temperatures. There have been many studies illustrating coherent relationships between surface solar radiation and temperature however, a direct link between aerosol emissions, concentrations, and surface radiation has not been demonstrated to date. Here, we illustrate a coherence between the trends of reducing anthropogenic aerosol emissions and concentrations, at the interface between the North-East Atlantic and western-Europe, leading to a staggering increase in surface solar radiation of the order of ∼20% over the last decade. It seems like a possible case of Occam’s Razor in action – the simplest explanation is the most likely. If i get this right, industrial pollution masked the natural warming from the Little Ice Age and the clean air initiatives caused the earth temperatures to rebound to normal levels. Do ya think this will turn Al Gore, Michael Mann, and Jim Hansen into advocates of burning coal with high sulpher content? It would sure help Appalachia if they did, and kill the effects of bad ole CO2 in just one blow. Ok, so the world is happily warming out of the LIA at a fairly brisk but not worrying rate, then we get all industrial and start shutting out the sun. This is so effective that people start talking about a coming ice age. Then we decide to clean up our act, and over the next couple of decades we get the gentle warming we would have anyway plus catch up on the bit we’d supressed, eading to all sorts of apocalyptic alarm bells. About 15 or 16 years ago the planet caught up and things have levelled out since. That natural warming trend seen in the temp records as recovery from the LIA is so often dis-regarded. How many times do warmist types crow over record high temps. Or a record in record high temps. Record high temps would be expected with even with ZERO CO2 effects, through the oft forgotten natural warming trend we have enjoyed since the LIA. Sorry – too late. The science is settled. This window is closed. I remember the “pea soupers”, very opaque smog (smoke plus fog) when even the ground at your feet was difficult to see. That was in the sixties, but apparently it was worse before then. I have not witnessed anything like that in recent decades. I find this more believable than AGW due to GHG. Seems to make a lot of sense, so the Global Warming Industry will do their very best to ensure this theory is stillborn. C’mon trolls, do your best..
Joe makes a good point. In the seventies, climate scientists (including some of the same culprits), were warning of an imminent ice age. Then it started warming. It does fit. Base on this theory Washington D.C. should be friggin freezing with all the crap being thrown into the air there. I remember this scenario being discussed years ago here at WUWT. Not sure how much I buy it. 20% is a whole lot. Today it’s hazy in Santa Rosa and the nearby mountains to the East are bluish and low-resolution, unlike their usual crisp definition. The light on my garden is diffuse and the temperature is about 10 F lower than yesterday. I began monitoring fine particle (PM2.5) levels in my back yard last week and after 5 or 6 consecutive days in the 1-5 ug/m3 region, today it is more like 50. So one can well believe in the effect of aerosols in reducing solar radiation. Prevailing theory is that atmospheric nucleation is a ternary reaction process involving sulfuric acid (resulting from the sulfur dioxide produced in this country by the great power plants of the Midwest), ammonia (from feedlots, for example) and water vapor. While living in Virginia, I monitored ultrafine particles and could see the process begin between 10 AM and noon, reaching very high concentrations approaching 100,000 per cc, and then declining in the afternoon. These “nucleation bursts” covered enormous areas (thousands of square kilometers) and happened fairly often, several times a week in summer, somewhat less often in winter. Moving to Santa Rosa last year, I did not expect to see them happening here, since the West doesn’t have much sulfuric acid in the atmosphere. However, I began monitoring UFP here last week and saw an increase up to 40,000/cc on one or two days last week. Maybe the nitric acid here can also participate in the nucleation process. Unfortunately, ultrafine particles are not on the EPA’s radar, despite the evidence that they can produce severe oxidative stress and perhaps even broach the blood-brain barrier by using the olfactory channel, so very little monitoring of atmospheric levels is occurring, thus making it impossible to do epi studies linking concentrations with health effects. One such study occurred in Erfurt, formerly East Germany, where UFP monitoring occurred over several years and was sufficient to show that mortality from cardiorespiratory disease was significantly linked to UFP and NOT to fine particles (which is what is regulated in the US and Europe). 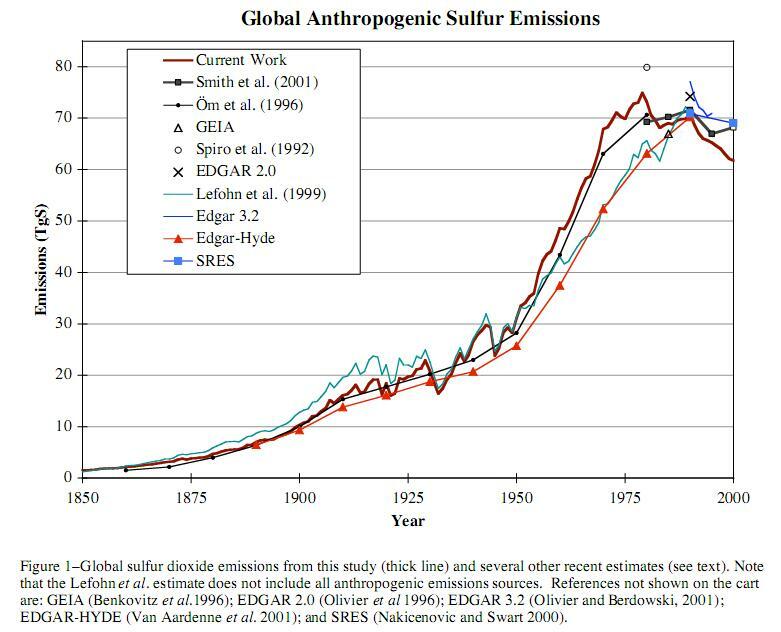 One wonders whether the increase in sulfur dioxide that will occur in Germany and China and India due to coal will be sufficient to roll back the general decrease that occurred in the 43 years since EPA was created. Perhaps not if good scrubbing techniques are employed. Count me out. This smells just like the claims that the ~1940-70 cooling was caused by (man-made, unmeasured) aerosols. This hypothesis only runs marginally OK from ~1940 onwards. It has no explanation for the ~1910-40 warming, or for the cooling before that. To me, it’s a non-starter. If that is so, could the increasing aerosol pollution being produced by China be part of the reason for the “global warming” standstill occurring for the past decade or more? Jonas, look up “Little Ice Age”. You’ll better understand why it was warming in 1900. I bet the BBC fails to mention this. Could the pause be the result of polution from China and India? The warmists will probably say this even more reason to stop burning fossil fules. Is this a peer review paper….? I could not tell from the link. I am an unashamed Denier, but I have noticed two, somewhat contradictory streams in papers which are in disagreement with CAGW. Many are like this one, explaining the temperature increase in terms of something besides CO2 levels. In fact, there are multiple explanations which have appeared here. The other stream argues that there is little or no GW when questionable “adjustments” are taken out, proxies are fixed, etc. Bad physics and bad ideology are not mutually exclusive. Warmist theory predicts anything, but it seems we are suffering from an excess of explanations which predict the same thing. Count me out as well. Weather pattern variations can also account for the increase and decrease in aerosols. By FAR the most prevalent is soil and plant dust which has a pattern variation tied to periods of drought caused by weather pattern variation, the next is salty sea spray which is tied to winds, again caused by weather pattern variation. And then there are clouds driven away or allowed to stay depending on equatorial winds and humidity, again caused by weather pattern variation. Of the aerosols ascribed to human cause, the percent change of just those particles would not be capable of driving the temp trends. They are riding on the coattails of the big leagues. So John Tyndall was wrong, just like Darwin! Just like Piltdown Man was finally recognized as a hoax, so will some day very soon the entire climate science since 1971 be discarded. And all the youngsters now studying climate science to become do nothing rent seekers will have to find a way to earn their bread. I mentioned this in a post here in the past year. Nice to see the obvious getting traction. It also proves the adage “No good deed goes unpunished”. “Be careful of what you wish for” comes to mind, too. My motivation was the realization that some of the Arctic warming (pools and similar effects of insolation) can be explained by cleaner air. Even with low slant angles, the effect of sunlight will be greater through cleaner air. Deductive reasoning, at best, certainly. They fail to report lots of things. The number of unreal things the BBC fails to report is not greater than the number of real things. So, in other words, the EPA is responsible for global warming. People are stupid. Since about 1995 all German power plants burning brown coal have been fitted with flue gas scrubbers; with federal tax incentives; China still builds new coal power plants without. In the 90ies there was still the Waldsterben / Acid Rain hysteria raging in Germany so desulfurization was a top political theme. So the warming actually is manmade? Or rather man-cleaning-after-himself-made? That would be too much fun. Cleaner air however also causes cleaner and more persistent snow in the winter (and in polar regions). “They fail to report lots of things. Well DC is certainly a bit on the cool side at 73.8 °F Normal is 86 °F and the MAX was 98 °F in 2002. Also wondering, as many stations are in or near cities\ airports, how this will affect UHI for weather stations. Do you suppose 17 year temperature plateau can be credited to China’s increasingly dirty air? thought for over 20 years now that this is the case .. that IF man has caused observable changes in the earth’s temperature .. it is these changes in aerosols .. also note we reduced black soot in North America and Europe .. yet China .. mostly .. and Russia have increased coal burning and black soot emissions since the 1990s .. and at a much faster rate since 2000 .. black soot may explain Northern Hemisphere ice melt trends better than temperature changes .. per Hansen, J., and L. Nazarenko (2004) Soot climate forcing via snow and ice albedos .. “The calculated global warming from soot in snow and ice, by itself in an 1880-2000 simulation, accounted for 25 percent of observed global warming” .. not that I totally buy the “25%” figure .. but that in itself is a larger effect that Gavin’s claimed 20% CO2 effect within the greenhouse gas category of effects on global temperature .. and changes in greenhouse gasses .. in my informed opinion .. do not have nearly the effect land use changes have had ..
A friend in Alaska several years ago was complaining about the smog rolling in from China that was mucking up Alaska’s pristine clean air. …….. unless they can figure a way to tax it …….. then they will be solidly behind it. I think its interesting. We should not categorically rule out anything until its proven to be false. Especially in climate science, something we truly know little about. 20% Would indeed be staggering. Like MattN, I’m not staggered yet. I realise that many people are not old enough to have experienced smog. This is an attempt to explain what the smogs were like. Visibility would drop to a few feet and the best way I can think of it is very dirty fog. Fog is normally a dispersion of water droplets in air and smoke is a dispersion of particulate solids in air. Smog is a combination of both, so it has a much lower transmission to light and so the sky appears much darker and the air more opaque. The smogs in Glasgow and London and other major cities were pretty real and very spectacular. I expect US industrialised cities were even worse. Many people had serious breathing problems and lung conditions. Traffic would grind to a halt. Ships would be unable to navigate in rivers, ports or close to the coast. The pollution was not evident all of the time, but from time to time particular weather conditions would make the smog descend like an opaque curtain, reducing visibility to a few feet. Areas prone to mist, such as near rivers, would get badly affected. Basically, the solid pollutants in the atmosphere would nucleate on dispersed water droplets and the result would be very dirty fog. Smokeless zones were introduced in the sixties and in time, this solved the problem. Logical enough but only as a modulating factor superimposed on natural variability. Given the scale of the changes from MWP to LIA to date I don’t see the aerosol proposition as being significant. It does, however seek to maintain the ‘our fault’ meme by replacing the CO2 scare with something else that was human generated. Anyhow the improvements in developed nations would have been largely offset by deterioration in developing nations would they not? And then again how to explain the global cloudiness changes between regimes of zonal jets and meridional jets which seem to correlate with changes in solar activity. Gail correctly points out that natural variations in atmospheric opacity from wind borne sea spray and dust would be a far larger effect than our puny efforts. And all the youngsters now studying climate science to become do nothing rent seekers will have to find a way to earn their bread. The phrase, “Would you like some fries with that ?”, pops into my mind for most of these jokers. Honestly, if the electorate let them get away with that one without glorious Revolution then they deserve to freeze in winter! So, would one expect LH going from -3 to +3 to increase the relative humidity? Perhaps not. Considering there would also be isobaric heating which increases the saturation pressure thereby reducing the relative humidity. Hmmm. I’ll have to mull this over a bit more. What is certain is that air pollution was pretty significant back to the 19thC. This may have slowed down the LIA rebound, but does not explain the 1930-1950 warming. Schrodinger’s Cat – I remember it well from LA and Denver, as the Smog got better it turned into haze if my memory serves. That Netherlands data ties up with what l noticed about three years ago here in the UK. That here in the UK since 1930, there has been a much stronger link to changes in the annal mean temps and changes to the annal sunshine hours. Then they has been to changes in CO2 levels. As the amounts of sunshine hours go up so the the temps seem to follow. I remember the sky being a brownish-blue and wondered what it was that the old books talked about a vibrant blue sky. The Crayola “sky blue” crayon didn’t make sense to me as it didn’t have a brown tinge, Then the family went on vacation and drove through the mountains in Montana and I understood. The sky really was blue. By the time I graduated high school, the sky was pretty much that way everywhere. Then I joined the USAF and got assigned to Korea, and it was back to the brown sky again, especially in the winter with all the charcoal heating they used. I remember flying out and about 200 miles off shore, the color of the sky and sea went from a yellow-brown to a vibrant blue. Pollution can indeed be a problem. I remember the smogs well and the paper being discussed seems quite credible to me in view of my personal experience of these events.. Smoke was probably a major factor at that time in the industrialised parts of the UK and probably elsewhere. I just wish to make the point that I am not in a position to draw conclusions about the current lack of warming and the possible connection with pollution in China. I just do not have the data or personal observation on which to form an opinion either way. So, in other words, the EPA is responsible for global warming. UK coal production went from 72 million tonnes in 1853/62 and peaked in 1903/12 at 258 million tonnes. and then down to 208 million tonnes by 1943/52. A decade and more ago in posts on several blogs I wrote the following prediction. The global climate cooled for ~30 years from ~1940 to about ~1970. Alarmists then claimed the global cooling was caused by emissions of SO2 from power stations. The global climate warmed for ~30 years from ~1970 to about ~2000. By ~1980 the global cooling scare became untenable so the global cooling scare was morphed into the global warming scare. Alarmists then claimed the global warming was caused by emissions of CO2 from power stations. If the global climate cools for more than ~10 years then the global warming scare will probably be morphed back into a global cooling scare. This prediction was ridiculed by warmunists whenever and wherever I made it. Global warming has stalled for more than 16 years. The subject of the paper reported in the above post is a suggestion that SO2 from power stations has caused global warming to stall. I see no reason to change my prediction which I repeatedly made a decade and more ago. It’s probably already been said, but I think solar and ocean cycles have far more to do with it than just clean air, as the MWP to the LIA will attest. It’s an idea, but that study on such a short time frame with many other factors not taken into account shouldn’t be taken too seriously. As we know from many sources such as Vostok ice core data, since the end of the last deep ice age some 10kya, the planet’s been cooling gradually and can’t be due to just the air getting a bit dirtier. It can only be a matter of time before the SKS boyz are in full rebuttal mode against this paper. I predict a flurry of Guardian articles under the 97% banner – How long before resignations follow at the AIP? Global warming is the fault of the unwashed masses of mankind…. Remember when the sky was brown? Ha, go to Denver and look down from Look Out Mountain, or out west by Leydon Junction/Rocky Flats or from Broomfield. There exist a brown haze. This theory is far more convincing than the CAGW due to CO2 and other ‘greenhouse’ gases. However, first, I would like to check some temperature records that have not been surgically renovated to support the CAGW cause..
It’s just one more piece of the puzzle. It’s now the job of good climate scientists to put them together to show the whole picture. These silly warmists have a few pieces of the puzzle and have jammed them into some distorted version of the truth that suits them. They have a few pieces and refuse to look at the whole picture. Hopefully the capstone will be identified before too long. Well the general idea sounds plausible, including the possibility that Chinese (and apparently Indian) ramp up industrially, could be a cause of the present static condition. I’m bothered by the 20% number. A TSI number of 1362-6 (which used to be 1353) used to give a nominal 1,000 W/m^2 at the earth surface; this a result of blue sky scattering, plus atmospheric absorption; O3, H2O and CO2, plus “aerosols.”; which is about a 25% reduction. A 20% increase would take us back to around 1,200 W/m^2 at the surface, and I haven’t heard of any solar energy companies using a value like that recently. But in California, which historically has had real smog conditions, we supposedly have cleaned up our air (on average) so it is now cleaner than when the first covered wagons rolled across the borders. Now nobody in LA would believe that; but they are in LA, which should tell us something about them. I’m not in the Occam’s razor fan club. Einstein, also told us that scientific theories should be as simple as possible; BUT no simpler ! A full analysis of all that is going on climate wise; well at least Temperature wise, is still a very complicated set of interractions; so I wouldn’t describe it as a simple problem, or solution. But I can generally be persuaded, that processes which ALTER THE GROUND LEVEL SOLAR INSOLATION, are considerably more likely to explain climatic Temperature changes, than any GHG diddling with outgoing LWIR radiation. Yes that would include cloud feedback. Yes I do accept that GHGs interfere with LWIR escape. I just don’t see any plausible mechanism, for that to return significant “heat” energy to the surface. If this were the case, wouldn’t we expect cooling (or at least much less warming) in those regions of the world where aerosol depth has continued to increase (e.g. India or China)? The rolling out of electric might fit with the pre-1940s warming. Cleaner fuels and more centralised energy generation leading to less pollution perhaps. An increase in solar radiation reaching the surface did occur over 1980s-2000 as implied, especially with fewer shading clouds than during the global cooling scare period before it. However, given how much there is a match of five peaks and five troughs in sea level rise rates, humidity, cloud cover, and temperature with forcing from cosmic ray flux over the 1960s-2000s period of neutron monitor data as illustrated in http://s24.postimg.org/rbbws9o85/overview.gif (with reference links given: enlarging on further click), variation in human aerosol emissions would be supplemental to that, not the only factor. While I haven’t cross-checked the Wild global dimming/brightening article’s figures, likely it is basically right in what it says, just not including the bigger picture, making it the truth but not the whole truth. What about the Southern Hemisphere which is mostly ocean? I’m under the impression that the pollution from the NH has a hard time migrating across the equator. I also see an obvious error in the balance cartoons. If the LW up goes from +1 up to +2, the LW down, should only go from +2, up to +2.5, not to +3, because the re-emission from the atmosphere has to be isotropic, so only half of it can come down, the rest goes up. I’m not a particular fan of that diagram representation anyway. Empirically speaking, I remember discussing with my wife, way back in the early 80’s, how we both felt the sun seemed warmer on the skin than it had used to. So I’m not surprised by this paper. The surface currently receives 243 watts/sqM on average. 20% increase would amount to an extra 48 watts/sqM. Just based on the stefan boltzman law that would equate to about 12C rise, significantly more if one takes into account cloud and ghg effects. If true it would imply negative feedback strong enough to reduces 12C to about 0.5C (assuming all the “adjustments” are justified). Even accepting that negative feedback is highly likely, that’s pretty strong negative feedback. Now where has this extra energy come from. Is it energy which was previously reflected back out to space. If so the change implies a change in albedo from 0.3 to about 0.15. Since we monitor albedo from space I find it exceptionally implausible that such a huge change would not have been observed. Is it energy previously absorbed by the atmosphere. If so it is still energy injected into the biosphere so overall it may not have all that much effect. However reducing the energy injected directly into the atmosphere by a massive 48 watts/sqM (and it is truly massive) should have had very noticeable effects such as cooling of the atmosphere, a change in the apparent lapse rate or substantial change in height of the tropopause etc. None of these seem to have been reported. To put it in perspective, the generally agreed direct impact of doubling CO2 is about 3 watts/sqM so this is something like 16 times larger. If doubling CO2 could have any noticeable effect this should be a standout red flag no one could miss, even with crude instruments. This is something that I have tried to bring attention to in Australia. The Gillard Labor government came into power on the leader declaring there would be “no carbon tax in the government I lead” but promptly went into a convenient alliance with the greens and independents to form a government. C02 became the devil, the looming disaster, therefore a carbon tax HAD to be imposed to stop “Dirty Carbon Polluters” and save the planet. The green mantra meant that they must point out we were very large polluters when measured on a per head of capita basis in world emissions of C02. Our industry was to be crippled on the alter of demonizing C02 with emotional claims and unproven theories. I tried to point out that the “Black carbon pollution” that Prime minister Gillard liked to claim when referring to C02, had in fact been removed along with other atmospheric pollutants for 30 years or more by way of very stringent EPA regulations and the installation of expensive emission scrubbers in all smokestacks, and intensive monitoring of other forms of pollution. Australian Industry and the Australian public had paid the cost, had paid the higher prices of the resulting domestic goods, and here we were being asked, to pay crippling additional costs because we had a small relative population when compared with other developed nations, when it was our leader trying to justify a huge carbon tax that would cripple our industry, reduce jobs as we paid guilt money to the green movement and what a lovely tax liked to ever rising C02, a tax meisters dream. Of course they claimed the moral high ground as the reason for the carbon tax, why else? You have to wonder, as the green movement was insisting we must also close down our coal fired electricity generators, that had supplied us with some of the cheapest electricity power, we also could not build any dams to increase Hydro power output though we had several flood prone rivers suitable. My take was that we had cleaned up the atmosphere so much perhaps we had allowed more sunshine through? The same government after imposing a carbon tax was encouraging the sale of our 500 year reserve of best quality coal, in an enhanced export program expected to cut that use time in half by exporting the coal to be burnt in countries like China and India, to fuel their power stations and feed their industry. These countries, unlike Australia haven’t been burdened with the need to scrub emissions of any kind from their smokestacks or clean up their own wasted environments. Tasmania the Australian island state was once the “apple isle” of Australia, with large Forestry industries, and blessed with abundant Hydro power that supplied the cheapest electricity in Australia. Tasmania has been a hotbed of green activists, Taken over by green zealots who decimated the Forestry industries, reduced employment prospects. It now has the most expensive electricity in Australia, high unemployment, high welfare dependency and some of the highest food, fuel and commodity prices for domestic consumption. America should send their economic experts to study how green activists can so cripple a state economy and reduce it to basket case status, before heading down that Green poverty path. aerosol variations come into play, as in the NH. The BBC Horizon (think PPS NOVA) did a whole one hour show on global dimming back in 2005. Of course back then to explain the cooling 1950-1980. Surprised more people did not comment on it here. Either way we sure should not be worrying about cutting CO2 as it is most likely a very small factor in warming which will not be a big deal at all. Any changes, most likely to be small, we will adapted to and not even notice. 1) Does anyone believe that China’s air got cleaner between 1980 and 2000? I don’t. 2) If ∼20% increasing surface radiance over the last decade is ballpark correct globally and if increasing surface radiance is an important driver of temps, how is it that global temps have stagnated in the last decade? 3) Won’t these materials also absorb IR? IOW, isn’t it possible that increasing tropospheric concentrations might trap heat making temps higher? Let’s keep the Sun out of this eh. smoky vs clean air is a factor, but not the whole story. Why the ” shocker ” superlative ? It’s old news. Well, not to be dramatic or anything, but NO! Your point is close, but I think misses few things, most important that first-and-most-important “average” watts/sq mtr. Break that whole problem up by latitude 10 degree latitude bands and then try again. See where that logic leads to. See, the “Clear Air Act”ONLY affected the USA from a narrow band of 40 north to 48 north. The south (say between the absolute furthest south point of Key West at 24.5 latitude up to 40 north latitude) had very little industry, and most of its “air pollution” if it could be counted at all was dust and dirt and tree pollen and emissions (Ozone is still high even today from the billions of pine trees …) LA was dirty, but that was one valley in one state. Where was the rest of this “pollution” that everybody claims? Overseas? Europe was also in the high 40-50 latitude. Sahara (etc) are down low in the northern hemisphere. Nothing below the Equator to speak of that would be “turned off” to “stop” pollution. A. More is absorbed on the surface the closer you get to the Equator as a function of the cosine of latitude: At low equatorial latitudes, MUCH, MUCH more gets through the shallow air masses between the earth and the sun than reached the surface at higher latitudes. C. ALL that solar energy that was absorbed at ANY latitude will be readily emitted back into space directly away from earth with a air mass of 1.0 by definition: The earth and sea will radiated “straight” into space, but will always be able to absorb less and less energy as you go away from the Equator to the pole. D. In addition to the ever higher and higher attenuation of the solar energy through the atmosphere as it is absorbed trying to reach earth surface, less and less hits the earth’s surface per sq meter as you get closer to the poles because the earth’s surface slopes away from teh sun’s rays . 1850 to 1950 warming, blame man. 1910 to 1940 warming, blame man. Recent warming, blame Michael Mann and his Hockey Stick Trickery. Quick, Mr. Obama, tweet it. So, now we have 2 candidates for inadvertent anthropogenic effects? Fix the smog, warm the earth. Fix the ozone hole, warm the earth. Count me out of any theory attributing global variation to anthropogenic climate change of any stripe. To quote Rumsfeld, “we don’t know what we don’t know.” Enough already. We need to figure out the natural cycle first, and put the loons in the box with the cat. Can this technique illustrate differences between Northern and Southern hemisphere measurement trends and or model outputs? Would that be a further proof of the technique? The world has warmed by 0.8C since ~1850 / 1880. Most of the rise between that time and 1950 was mostly natural. What is the present problem? At most 0.4C? How much of that was caused by man? As 1st world Clean Air Laws were becoming effective, 3rd world air pollution skyrocketed. Mace Head is hardly representative of the global atmosphere. I would disagree with one point. The air didn’t get cleaner because of laws, but because technology and wealth enabled us not to pollute. China would love to clear the air over their cities. But this won’t happen until they reach a certain stage of development, and no law will change that. I’m not being pedantic here. The fallacy that regulations improve our lives – rather than technological progress – is a belief driving many of the policies in the west today. … for what purpose …? Nope, nothing more than a small factor. Do any of you remember Bob Tisdale’s analysis? If it were aerosols we wouldn’t see the stepwise warming. It’s no more likely that aerosols created this warming than GHGs. For aerosols to have a cooling effect they need to get into the stratosphere. Man-made pollution just doesn’t get that high in any quantity. When lower in the Troposphere they have both a warming and cooling effect. Yes, they block sunlight but they also act like GHGs. The net result is they don’t have much effect at all. Also, why did the recent warming stop right when the ENSO/PDO went into its cool mode? Why has the temperature trend matched the Pacific ENSO variability for almost 100 years? As Zeke noted, why don’t local patterns show more cooling where aerosols are the highest? I’m afraid this is just another example of climate science failing to look at the bigger picture. SH – not so much. South America? South Africa? Australia/New Zealand? Pitcairn Island? Since there is about 10% annual interchange across the ITCZ, and much of the muck has a short residence time in the atmosphere, there should be a significant difference. a 60 year climate cycle. Hurricanes also have a 30 year cycle, don’t they? on climate such as soot and albedo changes). If this hypothesis is proven correct, this looks like the “law of unintended consequences ” in full effect. Hmmm …. what’s a good environmentalist to do ???? This is an example of why” The science is settled” claims of Big Al and other Mann made global warming promoters are such utter garbage. Ignoring the affects of the sun ,oceans and even improvements to air quality (with note worthy exceptions vary apparent) it is contrary to basic principles of science that a trace gas (CO2) drives temperature as these promoters say. Yes humans have an affect and the long term trend has been warming fortunately. Can you imagine if the world had actually bought their BS and the cooling over the last 16 years was attributed to reduced CO2 ? Instead CO2 is up and temperature is flat. We need to use less and what we do use more wisely… no doubt..but this scam is over. The 1910 -1940 warming was caused by electricity (and to a lesser extent gas) replacing wood and coal fires for cooking. In the USA and UK most new homes had electricity after 1910. This is fine to a point, but what would explain the decline between ~1878-~1910? In the UK between 1830 and 1900 coal production increased from 30 to 230 million tons. Air pollution would have increased in line with production, as consumption of coal in power stations, which pollute far less, was still fairly limited in 1900. Pamela Gray, Stephen Wilde, and Ed (and others with like arguments) win the day, here. The latest attempt to blame humans for “climate disruption” has provided NO EVIDENCE that the alleged human emissions’ effect is not obliterated-to-the-point-of-insignificance by nature’s emissions. Until this is PROVEN, no economy-devastating policies should be formed based on such conjecture. Did Bob Tisdale’s analysis separate the aerosols distributed primarily below the boundary layer from those above it, or did he analyze the troposphere as a whole? Hmmm….not convinced. It’s an interesting hypotheses but now you need to find a way to test it. Just making a series of statements that sound reasonable is not enough. The other side has abandoned the scientific method. We can’t do the same. Fascinating. This is a reverse Fallen Angels scenario, where government action against global warming makes it worse..
Jean, sorry I wasn’t more clear. Tisdale does not discuss aerosols. Those were my own thoughts based on reading many articles at WUWT. Bob’s area of expertise is oceans where he shows strong evidence that a constant forcing (like GHGs) do not fit the actual pattern of warming. I was simply pointing out that the same arguments hold for aerosols. Much of my aerosol thoughts were based on the fact that volcanic emissions seem to have very little effect unless we get a strong Stratosphere injection of aerosols. Willis also has a nice article about black carbon that I think is relevant. It’s a common misconception that atmospheric pollution has increased in China. As China industrialized and urbanized, people moved out of rural and urban homes where coal stoves and fires were used for cooking and heating to apartment blocks where electricity was used. This shifted coal burning from inefficient and polluting stoves to efficient power stations. Resulting in much less black and organic carbon pollution, although as coal consumption greatly increased, SO2 pollution greatly increased. This why India, where there has been much less urbanization, outside the monsoon season, has steadily cooled through the 20th century, while China has warmed over the last 30 years. This also explains why northern China has warmed 2 to 3 times faster than southern China, where the need for domestic heating is much less. So it’s all Anthony Eden’s fault. Hmmm….not convinced. It’s an interesting hypotheses but now you need to find a way to test it. This theory can be tested in any city in the world over the weekly aerosol cycle (The Weekend Effect). I have remarked before that it is scandalous that climate science, where real world experiments are notoriously difficult, has completely ignored the opportunity to measure the effect of various kinds of aerosol pollution on temperatures over conveniently short timescales. There has not been a single published paper in the last 20 years measuring the effect of urban aerosols on temperatures Excepting a few that show the effect of aerosols only the climatically meaningless DTR. Michael Hammer is starting to ask the right question. In spite of RACookPE1978’s comment it does not matter whether you use a world surface average 140 w/sq m average or direct insolation fron the sun 1361 w/sq m, if 20% more is received the temperature must go up a little less than 4% to radiate out the extra energy as heat (IR). Using a surface average of 13 degrees C (=284 degrees K) and yes I know lots will want to split hairs about that, but an average temperature rise of over 10 degrees C is required. The measured figures given by Sunshinehours1 for Netherlands was around 6 w/sq m (maybe 3.5%), and surprisingly match (or are less than) the increase given by Palle et al in 2006 (and earlier). That was from cloud cover changes ! Surely we need to understand the cloud (water vapour) effects better before we leap to other things. if people want to get an idea of what smog was like in the 60s & 70s in Los Angeles area .. take a look at pictures of Bejing these days ..
From the paper it appears that solar energy would be absorbed by the ultra fine Particles in the stratosphere leading to stratospheric warming. Otherwise the without a good level of particle reflectivity, if solar radiation is not getting through the layers of particulates to the ground, then a high amount of solar radiation must be absorbed by the stratospheric particulates leading to a long term stratospheric warming. As the stratospheric particulate pollution slowly drifted down during the couple of decades from the late 1960’s on and the stratospheric particulates were not replaced after the 1970’s due to the cleaning up of the industrial pollution, the stratospheric temperatures, with less and less solar energy absorbing particulates, would start to cool. Which seems to have been the case as it appears that stratospheric temperatures have very slowly fallen over the last couple of decades. Following the atmospheric nuclear tests of the 1950’s and 60’s it was found that the radioactive stratospheric residues from these tests took up to 15 months to cross the ITCZ from the northern to southern hemisphere. From this it would also appear that the equatorial weather systems are a considerable barrier to northern hemisphere pollution crossing into the southern hemisphere in any significant amounts. The Southern Hemisphere’s land mass including nearly all of South America, one third of the African continent, Australia and New Zealand, most of Indonesia and the Antarctica covers about one third of the global land mass area. Without Antarctica, the southern hemisphere’s land areas are reduced to about 24 % of the global land mass. Nowhere throughout these southern hemisphere land areas were there any large concentrations of polluting industry prior to the 1950’s when Australia and to some extent Argentina began to industrialise. Brazil and Indonesia only began to industrialise in the 1980’s and southern Africa still hasn’t any large concentrations of industry except in some pockets in South Africa. So compared to the huge industrial regions and high population densities of the northern hemisphere and their consequent capabilities to produce globe circling pollution and hypothesised cooling particulates, in the southern hemisphere such polluting capabilities from industry and populations were globally only of a very small consequence until late in the 1980’s..
From the barrier effects of the equatorial weather systems to the ingress of any northern hemisphere pollution into the SH and the lack of major population densities and the small industrial bases of the southern hemisphere, we would expect to see some quite large differences between the southern hemisphere and northern hemisphere upper atmosphere pollution levels and consequently the long term temperature records ie cooling in Northern Hemisphere in the 1960’s and 70’s and then warming from then on compared to a quite steady but very slow shift of temperature trends in the Southern Hemisphere over the same period. If the hypothesis as provided in the paper is near correct, any global temperature trends should show very significant differences between the northern and southern hemispheres temperature changes and trends over a 5 decades long time frame from the 1950’s to the 1990’s..
All due to effects of the probable differences in the amounts of stratospheric particle pollutants between the NH and the SH. A short two decade long [ NH only ? ] warming period upon which the entire claimed proof of a catastrophic global warming is solely and completely based. The Australian and NZ historical and raw temperature data has been severely corrupted and shifted to an upward trend in both countries by the more rabid warmists in both in Australia’s Bureau of Meteorology and by NZ’s even more notorious rabidly warmist cell at NIWA. This site below has done a large amount of Australian temperature analysis and has a lot of information on the very substantial adjustments made by elements in the BOM to Australia’s temperature data. So summing up, if the claims of the amount of stratospheric particulates being the probable cause of first global cooling and now as those high levels of particulates drift out and down out of the stratosphere, allowing clearer skies for more solar radiation to penetrate to the surface and a consequent warming,. there should also be quite large and easily detectable decadal variations and trends between the changes in temperature in the northern hemisphere and the temperatures of the southern hemisphere..
And just for interest, Because of our location and the sparseness of land masses in the SH plus the only locations that have trustworthy weather data going back over a century, Australian and New Zealand’s historical temperature records as utilised by climate researchers cover close to 25% of the global surface. So any adjustments, spurious or otherwise to our records have a very large impact on the historical global climate data and the flow on effects from the use of that data. So let’s say there’s something to this. Combined with banning of certain CFCs starting in 1978 which University of Waterloo’s Qing-Bin Lu said coincided with temperature rise until 2002. Then take into account the population growth and huge use of unscrubbed coal plants and soot from cooking stoves in India and China which could fully account for anomalies in China and India data (see figures above) that stopped overall heat gains post-2002, and we may have a more wholistic sense of what’s happening. Add in the polarity shifting of our sloshing, spinning liquid iron core and that potential set of effects along with the sun’s changes, and it sure looks like wasting time and energy on minuscule CO2 percentages is 100% pure foolishness. If were you are talking about is Santa Rosa California, I lived there for 10 years. What you are seeing is not smog, but a natural fog condition. You are living right on the edge of a fog forest. Many plants of fog forests are fog-eaters such as the Red Woods (and introduced gum trees). These plants emit aromatics that precipitate the fog and a leaf structure that captures the droplets. If you want to see real haze, then wait until there are some serious forest fires burning in the area! I am glad some readers are measuring actual particles instead of just talking about them. There are neighbourhoods in Ulaanbaatar (from where I sometimes write) with an annual average of 600 micrograms/cubic metre (PM2.5). Beijing is clean in comparison. The temperature in the city has been rising rapidly over the past 60 years but is now tumbling. I do not see any relationship between the PM and the temperature. It is pretty clear on extremely cold days and the worst pollution is in November when it is not all that cold. More than half the PM2.5 in Beijing comes from the farmlands around the city. That brings up the question of land use changes, not aerosols. My conclusion so far is that local effects are of little consequence. The brightening is real and some of us may remember the global dimming scare that was a kite flown for our attention some years back. It did not sell as well as CO2. Water droplets are very effective at scattering light. Agricultural methods have changed – is that not a large factor over that time period. Black carbon is a very effective air-warmer and sunscreen at the same time but it is almost always co-emitted with organic carbon. Maybe there is an interplay between the ratios of BC to OC that swamps all other considerations. Prof Liu here in Waterloo concluded it was Antarctic ozone that dominated temperature. Can ozone dim or brighten as well? At which frequencies? High energy UV for sure. Was the brightening gained and lost full spectrum or visible? Enquiring minds want to know. I only ask because Ive measured a lot of aerosols in a LOWTRAN scenario – but very few in a HITRAN scenario that weren’t related to an event that injected them into the upper atmosphere. Urban aerosols cause ozone production locally and for a large distance downwind. Atmospheric production of ozone and visibility reducing aerosols continues long after their primary precursors have been dilute to low concentrations. Clearly, some complex and poorly understood chemistry going on. I agree that we have little idea of the effect of various atmospheric substances,loosely called aerosols, have on temperatures, individually or in combination. The forcings ascribed to aerosols by climate science, are just the fudge factors used in the climate models. At this time, we cannot say exactly how much “atmospheric brightening” contributed to warming or how much China’s recent emissions contribute to cooling. What we can do is point out the remarkably poor reasoning of Alarmists. In doing so, I am just emphasizing what Mike and others have written above. We good hearted lovers of science have been begging the “Alarmists in power,” such as Hansen, to engage in real world research on natural variability. With regard to aerosols, we have a case of them refusing to engage in real world research on manmade (unnatural) contributors to temperature change. 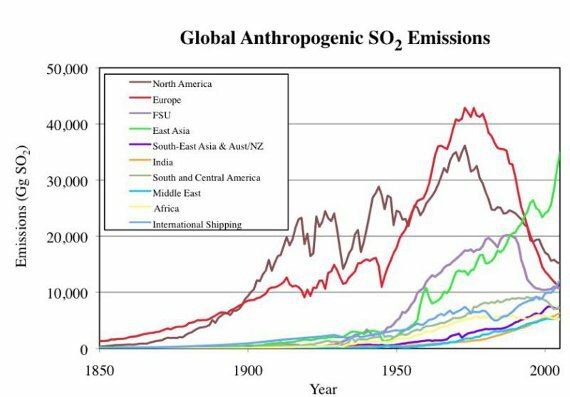 Hansen and friends were interested only in using increasing aerosols from China as an excuse for the “pause.” By comparison to the work of recognized scientists over the last 300 years, Alarmists simply are not interested in empirical research. Don’t you think a rational reason for that amount of increase in sunshine is simply a more positive NAO/AO and a more northerly Jet? That’s the way it usually works here. Sorry Joe, but you didn’t fix it. Zeke was right, the GCM’s do include the effects of atmospheric aerosols. Going back to Hansen, et.al. 1988. In Appendix B of Hansen’s paper, there are 4 things listed as having negative radiative forcings: stratospheric and tropospheric sulfuric acid aerosols, tropospheric desert aerosols, and land albedo. However, you are right also. They have failed to match reality, but more from overestimating green house gas effects than failing to include aerosols. Well I don’t know about where you live; but in California, our air has gotten cleaner, in spite of the clean air laws. First they gave us MTBE and ETBE in our gasoline to “oxygenate it”. That meant that less “oxygenation” could take place in your automobile’s under the hood “oxygenator” , aka “Engine”. That meant that we had to buy and burn more fuel, as well as getting rid of the oil company’s garbage for them. it had the added benefit, in that the fuel tanks leaked, and polluted about half the ground water wells in California. So we got the to remove the MTBE; but they replaced it with another “reduced fuel” oxygenator; Ethanol; which then placed greater strain on clean water availability, growing and converting all that maize. So we still get our quota of reduced gas mileage, causing us to burn more fuel along with the faux fuel. The ethanol fuel, has one advantage, if you leave the tank open a bit, if not driving, you can evaporate some of that junque, and get a better blend og gasoline, with less “oxygenator” in it. Well you can’t get around having to buy the oxygenator, anyway. Can’t blame the oil Companies though. They say they can meet all the fuel standards, without any ersatz fuel. Despite that, the car companies have made their cars much more efficient, despite being hamstrung by the unfuel gasoline. …peer review? Like having 12 bank robbers as jurors to pass judgment over a bank robbery case. At the possible end of the latest extreme interglacial, it might not matter one whit. Go ahead. Knock your H. sapiens sapiens selves out………. “Scientists exploring elevated fossil beaches and coral reefs on the remote western coast of Australia have found what they say is compelling evidence that near the end of the Eemian interglacial period, sea level jumped to close to 30 feet above the modern level. “During the Eemian, a warm period in Earth’s history that preceded the most recent ice age and a time when planetary temperature was similar to levels projected in the coming decades, sea level stabilized at about 10 to 12 feet above the modern level for several thousand years. However, the new research indicates the level then spiked an additional 17 feet. “In a paper published in late July in Nature Geoscience, Michael O’Leary of Australia’s Curtin University and five colleagues build on the work of scientist John Mercer. Thirty-five years ago, Mercer issued a warning about the consequences of human-related carbon emissions. ” His paper “West Antarctic Ice Sheet and CO2 Greenhouse Effect: A Threat of Disaster” points out the unusual topography of the ice sheet atop the western part of Antarctica. Much of the ice sheet is below sea level, in a bowl-like shape. According to Mercer, a climatic warming could lead the entire ice sheet to degrade rapidly on a geologic time scale, creating a possible 16-foot rise in sea level. “In a recent interview, O’Leary said he was confident that the 17-foot jump in sea level he found evidence for occurred in less than a thousand years. He didn’t know how much less. “The sediment record suggests a jump of this sort, according to Paul Hearty, a team member and North Carolina field geologist. Hearty has argued the possibility for decades, but measurement and modeling techniques have only recently reached the level of precision needed to confirm it. “The findings must withstand further scrutiny. Andrea Dutton, a sea-level scientist at the University of Florida not involved in the research, said the paper failed to disclose enough information about the field sites to allow her to judge the overall conclusion. OK, I got that. It may have already happened anyway, on much lower ambient CO2 during the end of the last interglacial. If it has already happened, wildly in excess of the half-precession old Holocene (and at much lower end extreme interglacial CO2 concentrations), what is it exactly that you would propose in terms of atmospheric CO2 concentration, to augment, delay or prevent our induction into the next glacial? But these are just Hansen’s best guesses on a given day. There is no empirical research behind what they have on aerosols in the GCMs. Anyway, if you had valuable empirical research on aerosols you would be trumpeting it from the highest mountain rather than using it in a GCM. The smoke from all those forest fires near Moscow in Summer 2010 made it hotter there. Summer 1783 in England it was roasting during the 3 months that it was engulfed in low level volcanic dust and fumes. Is burning coal why England’s Summers were hotter in the 1700’s than the 1900’s? I’m skeptical. This is a reverse version of the same hubris. Wild pays lip service to AGW/CO2 in order to prevent his funding from being cut off. But those statements aren’t backed up by anything in his papers. The science in his papers contradict AGW/CO2 if you had read them. Nowhere throughout these southern hemisphere land areas were there any large concentrations of polluting industry prior to the 1950′s when Australia and to some extent Argentina began to industrialise. It’s a Left Liberal myth that air pollution comes and came from industry. The largest source of atmospheric pollution up until the clean air acts was domestic burning of coal and wood. Motor vehicles pre-catalytic converters, and agricultural burning would have been the next 2 largest sources. Agricultural burning still occurs in Australia, and I believe it is still widespread in South America. Why so much love for anthropogenic climate change? Man is puny. Climate changes all by itself (and sun). Can I have my grant and Nobel prize please? I mentioned this in an article here two years ago. Because of pollution historic temperatures were depressed and because of the clean up we then got more sun. “Many of the cities with the longest temperature records- generally in Europe and North America- were industrialising rapidly as the thermometer came into widespread use in the 1700′s. Smog caused by the burning of coal, wood, and later gas, became increasingly widespread. Sunshine levels in the UK are said to be 40% higher now than during the worst years in London that culminated in the 1952 killer smog, which caused the various clean air acts to be enacted fully. Pollutants are said to create a cooling effect and it is easy to understand that foggy urban areas were likely to be substantially cooler than if the sun was shining. Inversions caused by these layers of air would have also helped to create temperatures that were vastly different-mostly lower-than they might otherwise have been. What effect this had on the overall temperature record over the centuries, in the many cities that smog affected to a greater or lesser degree, is impossible to calculate, but it must have been significant. Perversely, smog became a tourist attraction and many artists flocked to great cities such as London to observe and paint the effects it caused. Sounds plausible, but does the paper explain the stop in rising temps? With the oceans, containing 99% of climate heat, any attempt to explain climate which ignores dynamics of ocean circulation is ultimately doomed. This is the “deus ex machina” atmosphere-only thinking which characterizes the AGW narrative, the belief that only human atmospheric input and nothing else can change climate, with the oceans as a passive puddle following solar/atmospheric forcing in real time. What happened to the PDO and the AMO? What about the AMOC, the bipolar seesaw and inter-hemispheric heat piracy? If we go down the road ending in believing that every fart affects the climate but the oceans are irrelevant, we will have totally lost connection with reality. So CO2 would have warmed the earth during the 1945 and 1975 period if it wasn’t for the air pollution. So this result confirms the arguments the warmists always used to explain why there was a lack of correlation between CO2 and T for that period. So nothing new. Yes but the last decade has not been warming. Would it have cooled a lot instead? without the increased radiation? As well as power stations being built and grids being rolled out in the periods you mention, there was WW1, WW2, many ground/air nuclear bomb tests, several other wars which require significant industrial activity to support and would have kicked up plenty off dust. After years following this, I’ve come to the conclusion that there is no global warming, never was (slight variations with ocean changes excepted). Its a statistical artefact caused by cooling the past in the surface temp history, a bit of unaccounted uhi, stuff like that. The reason for the ‘pause’ is that they have run out of fiddling room, pure & simple. The more I watch the sat temps bumbling around a 0.3C variance, the more I’m convinced. So this paper is just another attempt to explain the ‘pause’ without wanting to see the elephant in the room. Do Inda and China know all those global climate refugees are headed their way? [ note to self: proofread before post! ]. That should be “India” above instead of “Inda”. I’m not actually sure where the evidence is to show that the developing world and China have many pollution controls, I thought as the levels of pollution were controlled and reduced in the West, then the economic development in China and the Indian sub-continent etc, more than made up for it, so that worldwide they are now at levels of the late 1960’s. If this is the case then the build up of various types of pollution may very well have moved around the world, but have not fluctuated much. Not sure where it leaves the AGW theorists and their excuse for the lack of warming since 1998. It is interesting to note that where ever there is an unexplained lack of warming then the particulate / pollution excuse is rolled out, only to be rolled back when any warming starts again, shazam ! just like something out of a Harry Potter film. It would be a wonderful irony if it turned out that global warming was caused by environmental laws. Probably most of the clean air acts were enacted in the developed world, so, if this idea is correct, you might expect to see more warming over the developed world e.g. Europe and the US. If I remember correctly, more global waming occurred in the northern hemisphere and it does appear to be concentrated over the developed world. It would be interesting to see if there is a significant correlation between the amount of warming and global regions which are more and less developed. The draft comes from the Intergovernmental Panel on Climate Change, a body of several hundred scientists that won the Nobel Peace Prize in 2007, along with Al Gore. Its summaries, published every five or six years, are considered the definitive assessment of the risks of climate change, and they influence the actions of governments around the world. Hundreds of billions of dollars are being spent on efforts to reduce greenhouse emissions, for instance, largely on the basis of the group’s findings. The coming report will be the fifth major assessment from the group, created in 1988. Each report has found greater certainty that the planet is warming and greater likelihood that humans are the primary cause. The 2007 report found “unequivocal” evidence of warming, but hedged a little on responsibility, saying the chances were at least 90 percent that human activities were the cause. The language in the new draft is stronger, saying the odds are at least 95 percent that humans are the principal cause. April to August 1952 on CET are very much on the warm side, do you have figures for London during that smog? Extra irony here when you think about how the CAGW folks have sold the scare to the general public. Most non-scientists are screaming about “carbon pollution” causing the world to heat up. They think “pollution” is causing warming. They get furious with you if you argue against the climate alarmist agenda because they are certain you are against stopping “pollution.” So you must either work for the oil industry, be an idiot or hate the planet. Perhaps a great moment for us to push back if we could get folks to understand that what they think of as pollution, sooty emissions, cools the planet. Here is London weather. seems to be on the cool side in 1952. The smog was very ,localised and Greenwich due to its height/location may have missed it. You have copied your daft post at August 20, 2013 at 4:06 am on another thread. I refuted it there and this link goes to my refutation. The smog in London was a photographers delight back then. Soft, diffused light. Also explains why Northern and Southern hemispheres behaved differently. Notice the slight of hand change from “increasing” climate extremes to “changing” climate extremes. So now any climate extreme change, IE up, down, more, less, here, there, is likely at least greater than 50% prompted to occur because of human factors. So now we have the bottom line. Humans cause bad weather. We have made a complete turn around back to caveman days when lightening was a sign from the gods that we have done something wrong. Quick! Find a virgin! What a crack of horse sh*t.
First off I suspect that the is ** NO ** direct linear relationship between electromagnetic radiation hitting a small particle of “something” or pollution and the amount of radiation is back scattered. Anybody care to share an “energy balance” equation of an airborne particle being struck by radiation – from the sun? We go from -24 to +10 and now back to -3. What about the 1930’s Dust Bowl? (1932-36) When dust from the Midwest was blown all the way to Washington DC? 1. We know the 1930’s were hotter than now. When inspecting old buildings, there’s often some evidence that it was heated with coal at one time. Even really old buildings, originally heated with wood, may have had a central coal heating retrofit. Old wood burning fireplaces may have been blocked off and coal stoves had been piped into the old chimney flues. Some buildings still have their original coal fired boiler or furnace, but it has been converted to fuel oil or gas. In many 19th century homes, an old abandoned chimney used to serve a coal cooking range in the original kitchen. Many basements still have their coal bin…. The avg ignorant warmer would just use this to justify EPA expansionism. They think CO2 is just another pollutant. Notice the slight of hand change from “increasing” climate extremes to “changing” climate extremes…. If you can not blame humans you can not scare them into changing their behavior and demanding homage and indulgences (taxes) be paid. This sounds like more of the same, the weather is bad humans are to blame, crap. Is there some truth in it? Probably but as with the CO2 scare the truth is a tiny kernel wrapped in propaganda and distortions. The CO2 propaganda is getting quite a bit ragged around the edges and this helps prop it back up. The Climate modes were off because we left out Human Caused aerosols. Heck you can even blame the Dust Bowl on humans. Remember the farm dust which the EPA now wants to regulate. I agree with MattN and Michael Hart and Geo Smith and many others, above. The 20% figure doesn’t pass the sniff test. Way too much compared to my sight test and other personal observations. I, too, as per Richard M, was thinking of Bob Tisdale’s work in this context. I just can’t subscribe to the theory. But the science isn’t settled yet, is it? One of the problems with trying to PROVE a correlation between cleaner/dirtier air and more sunshine/less sunshine is the lack of data. I’ll use Canada as an example. There used to be over 250 stations collecting bright sunshine data in 1970. Now there are 7. Spain. 6.5W/m2 per decade increase in summer sunshine from 1985-2010 . A doubling of CO2 is supposedly only 3.7W/m2. In the mid 2000s, the anomaly was 9.48 hours more sunshine per month. Thats over 100 extra hours per year in a country that gets around 1400 hours. 7% averaged over the whole year. Thanks for the link to the “Beautiful Smog” article by Karlins. “Here is London weather. seems to be on the cool side in 1952. The smog was very ,localised and Greenwich due to its height/location may have missed it. It’s more than lip service. Dr. Wild is Associate Editor of the Journal of Geophysical Research, a publication of the American Geophysical Union. He is also a Lead Author on the IPCC’s AR5. In many interviews and publications, he expresses his belief in the enhanced GHG effect. (See http://www.iac.ethz.ch/people/wild.) I rest my case. I think Dr. Wild would view his findings as complementing GHG theory and I see examples of that in his papers. The best example is in his detailed discussion of NH vs. SH climate model accuracy. In any case, there definitely is one glaring discrepancy: If the recent “pause” in surface temperatures can be explained by Wild’s global brightening theory, what does that say about Trenberth’s theory that the heat is hiding in the deep ocean?? It will be interesting to see how the Climate Establishment deals with that. Wild, a member of that establishment and a scientist with impeccable credentials, cannot be easily dismissed. So do I. That doesn’t make me any less skeptical of CAGW. If these ideas hold up he is knocking a great big whole in the warming from the 1950’s being mostly due to GHG’s meme which has resulted in the high sensitivity belief among the alarmists. This in turn would make a low sensitivity much more likely than not and a high sensitivity very unlikely. Go Dr. Wild (and keep your head down). A “belief” is no substitute for science. Wild’s papers are full of data and science showing changes of .5W/m2/year due to changes in surface solar radiation. Changes of that magnitude dwarf the supposed effect of CO2. In our neck of the West Country (Torbay) we get around 1700 hours of sun per year. There is quite a proliferation of solar farms round here as a result but this pitiful amount is of course heavily geared towards the summer. Who (without a large subsidy) would build a 50 acre (50 acres!!!) solar farm that would barely power a torch in the winter when energy is most needed? Of course it is even more needed on a cold winters NIGHT. Wonder how the solar farms will perform then? The Uk’s energy policy gets dafter by the minute. Can anyone remember “pan evaporation rates”? Is this a retooled version of the “Global Dimming” theory [who was that again?] that we were harangued with 10 years ago, explaining why the CO2 induced warming predicted had not yet come to pass and that as soon as we cleaned up our acts things would suddenly get “much worse”? On the surface of it both versions seem like plausible explanations, which one will gain the most traction with observations? I think a lot of us (including me) have been wondering along these lines for many years. I think it was Hanson who first said that air pollution would warm the surface, and then later came out with the opposite hypothesis. I would think it would depend on the altitude, if it absorbs heat near the surface, the surface warms more, if it absorbs heat further up, then the surface loses out. Pan evaporation rates are affected by wind speed, which globally have been dropping. I thought virgins had become extinct due to global warming? generations on Earth.” When this article is put in its proper context it paints a much different picture. Scott, I prefer earlier Wild research. ,5 Watts / m2 / year totally overwhelms the supposed CO2 signal. Sorry, but NO! That is a misunderstanding. The GCM’s don’t “include the effects of atmospheric aerosols”. They each use a different value of assumed aerosol cooling as a ‘fiddle factor’ which compensates for each GCM using a unique – and too high – value of climate sensitivity to “green house gas effects”. It seems I need to post the following yet again. The question is: if climate models differ by a factor of 2 to 3 in their climate sensitivity, how can they all simulate the global temperature record with a reasonable degree of accuracy. Kerr  and S. E. Schwartz et al. (Quantifying climate change–too rosy a picture?, available at http://www.nature.com/reports/climatechange, 2007) recently pointed out the importance of understanding the answer to this question. Indeed, Kerr  referred to the present work and the current paper provides the ‘‘widely circulated analysis’’ referred to by Kerr . This report investigates the most probable explanation for such an agreement. It uses published results from a wide variety of model simulations to understand this apparent paradox between model climate responses for the 20th century, but diverse climate model sensitivity. re your post at August 19, 2013 at 8:58 pm. Yes, I have made a long post which explains your correct point, but – for some unknown reason – it is waiting in moderation. 20% ! That’s a sabre-tooth in the living room. Dinner is served! Seems to me that aerosols aren’t THE answer but they are certainly part of it, along with many of the things we discuss here. My take is that the effect of aerosols is a suitable candidate for more research. Are the basic ideas about the aerosol loading correct? I think the natural aerosol loading is incorrectly estimated! According to Natalie Mahowald, the amount of dust in the Earth’s atmosphere has doubled over the last century. Global Circulation Models overestimate the amount of cooling dust by a large factor. And do not account for warming silts!!! tuned to match radiative measurements, !!! Have they corrected GCMs to account for silts? Has there been an ever increasing amount (getting dustier over the last century) of ‘missed’ silt aerosol which would have a radiative warming effect? I have a problem with this proposal. This appears to be an urban issue and not a global issue. If global brightening is fact, what now, do we wait until it gets too cold, then light up anything that’s coal fired? What is totally unconvincing about the pollution-driven dimming/brightening explanation of world-wide temperature swings in the latter half of the 20th century is that the Southern Hemisphere, where such pollution was minimal, swung quite coherently and in-phase with the NH, where the pollution was the greatest. Since, there is very little exchange of air masses between the hemispheres, something quite different is manifestly at work. @1sky1 . . you overlook the enormous amount of forest and savanah that is burned every year in sub-saharan Africa which I understand is similar in South America too. It generates a huge amount of soot and other particulates and goes on from late June to the end of October. There are no good datasets of solar insolation (sunlight reaching the ground) pertaining to the 1950’s or 60’s. Actually, good solar insolation data are hard to come by. So records on solar insolation everywhere were of interest, as the records could be used to determine whether a given place was too habitually cloudy for solar power (nowadays it’s put in everywhere, even though it’s feasible nowhere). Well, the database consisted of bolometric measurements— you measure the temperature of a blackened surface that is exposed to the sky. It was found that the autorities had neglected calibration of the bolometers for decades (they’re not particularly easy to calibrate). And so there was a downward drift in the measurements of insolation due to such things as the black becoming not so black. Or the glass cover suffering a thin-film buildup. So no, you can’t trust one of these warmer profiteer “scientists” to come up with anything but another publish-or-perish article from time to time. You apparently are unacquanted with those places. In Sub-Saharan Africa June to October is the peak of the monsoon season and there is no widespread burning going on. Dust raised by Harmattan winds during the dry season is the chief source of particulates in that region. Slash and burn agriculture is not a serious issue there. There has been much land-clearing by fire In the Amazon basin in recent decades; however, carbon soot does not stay long in the atmosphere there. In any event, it cannot explain both hemispheres being in sync in their recent temperature swings. 1sky1 . . sorry , the dry season in sub Saharan Africa runs from the end of May at the latest to the end of October. I have watched weeks of nothing but smoke in the air from Mozambique and right across Zimbabwe into northern Botswana. Bush fires are a real thing and they dim the sun bigtime. Sorry, but sub-Saharan Africa is a geographic term that refers properly to the Sahel and the equatorial forest zone along the Gulf of Guinea. You are talking about SE Africa. Nevertheless, your basic argument doesn’t hold, because slash-and-burn agriculture there is not a post-WWII activity; it has been going on for centuries. The inter-hemispheric coherence of the recent multidecadal temperature swings remains unexplained by bush fires that you’ve seen dimming the sun. If anything they should produce dry-season cooling in SE Africa.